When Mary Shelley first introduced her reanimated monster in the 1818 novel Frankenstein: or, The Modern Prometheus, it sparked an impassioned debate that extended beyond literary circles, a debate that’s carried forward for nearly two centuries: Is immortality within the reach of modern science? The protagonist’s quest to abolish the limitations of basic human physiology—to overcome limits, create something new, breathe life into a lifeless body—is one that speaks to the soul of bodybuilders everywhere. But it’s especially applicable to the 13 winners of the Mr. Olympia title, for whom a modest bronze statue represents a form of immortality few will ever taste. In true Shelley fashion, we’ve identified the best parts of several Sandow winners, spanning nearly five decades, and “surgically” adjoined them to produce the monster of a man you see here. Some may cry sacrilege, but once you’ve perused the notes we’ve included on how each body part was built, perhaps you’ll stop short of calling us heretics. You see, the parts we sourced weren’t hastily created in some dank, dark laboratory. They were built in gyms, over years, through constant experimentation in which failure was the norm. What emerges is an intricate patchwork of exercises, sets, and reps—the proven formulas that produced the body parts for which each man has come to be known. Here, we’ve laid bare these programs for your own sinister aspirations. Jay Cutler carries great quantities of muscle. And, like Coleman, whose shoulders helped to visually narrow his waist, Cutler has a set of quads that put everything else in soft focus. The four-time Mr. O has made a living out of dwarfing everyone else onstage when it’s time to hit leg shots. At contest time, Cutler’s legs are wide-swept and striated to bits. Front abs and thigh poses are usually no contest; and when he angles his toes out slightly, even in “relaxed” poses, the quad curvature he presents is frightening—as if he plucked them out of the pages of a Hulk comic. Like a lot of lifetime lifters, Cutler’s a fan of getting the joints warm and ready for big workouts, which is why he leads off with a pair of sets at the leg extension, not done to failure. What follows is anything but fancy, with stops at the leg press, hack squat, and front squat. While the barbell squat is normally associated with maximum leg growth, it doesn’t provide the same emphasis on the quads as the hack and the front squat. Cutler uses both to his advantage by performing four sets of 10 on each. The lunge is more of a hybrid exercise—it does hit the quads because of the knee flexion required but research has actually revealed it to be more beneficial for strength development in the hamstrings. Finishing with the leg extension allows Cutler to isolate the quads completely and to stay heavy by using a controlled range of motion. as being more impressive than others. But the eight-time Mr. O’s shoulders were wide and all-over grainy, with deep channels separating each distinct deltoid head. He may have had a larger canvas than most of us are blessed with on which to paint his masterpiece, but we’d all be wise to take a few cues from his shoulder- training ethos and methodology. Coleman led off his shoulder blasts with an overhead barbell press to attack all three deltoid heads. He’d occasionally mix in the Smith machine version if he didn’t have a spotter or was just in need of a change, but four sets using progressively heavier weight was par for the course. Highlighting his penchant for width-building was his approach to dumbbell lateral raises, where he’d do reverse dropsets, making three weight increases (without rest) while dropping his rep count slightly on the first two. From there, Coleman would typically finish off workouts with front raises and bentover laterals to zero in on his front and rear delts. 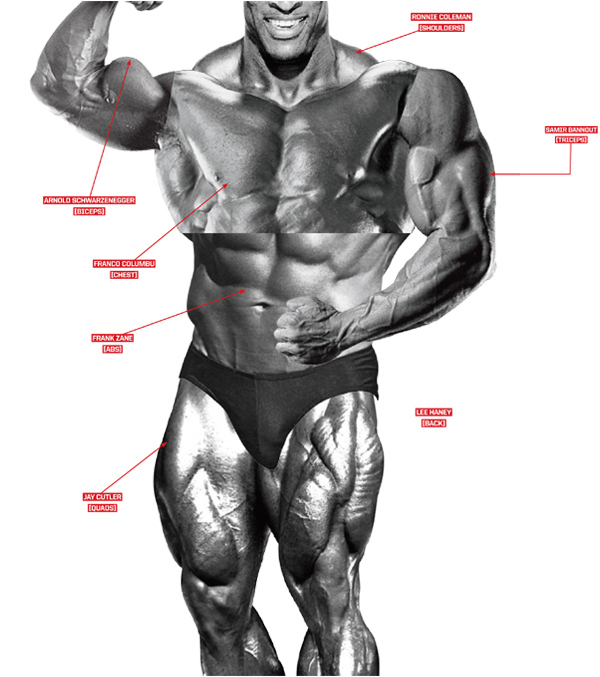 The most charismatic and well-known bodybuilder of all time was the owner of several legendary body parts. His enormous pectorals oozed alpha male, true—but there’s no lifter who hasn’t, at one time or another, aspired to have biceps like the Oak. His twin peaks were cartoonish in both their size and detail. Schwarzenegger trained his biceps for width, height, and length. The barbell cheat curl, in which he’d give a little sway as needed to complete tougher reps, was his typical go-to first movement, so he could move very heavy weight when he was fresh. Incline dumbbell curls would emphasize the biceps’ outer head, which is most visible in a rear double-biceps shot, while the preacher and concentration curls would target his short, inner head, the one that makes up the biceps’ peak in forward-facing poses. Schwarzenegger was also a big believer in volume—it wasn’t unheard of for him to perform 25–30 sets on arm day. fact that the triceps accounted for most of his upper-arm mass. Bannout rejected the pressdown and concentrated on dips, which helped him overload his triceps. The result was big, braided triceps that still rank among the best ever. The dip is a great first move on triceps day. Bannout preferred to keep his body as vertical as possible while performing it, because it allows for a greater stretch and more powerful contraction. He followed with eight sets of overhead work to emphasize the engagement of the long, inner head—the largest of the three. Dumbbell kickbacks were his favorite finisher, and, interestingly, recent research has affirmed his choice: A study released by the American Council on Exercise in 2012 revealed the kickback to register a higher level of muscle activity than nearly every other triceps-focused move the scientists tested. No sooner did Frank Zane leave the stage for good than people started nostalgically referring to his physique as “classic.” His barely there waistline and deeply channeled abdominals became the standard for competitors who followed. But his sixer wasn’t just for show. Zane’s famous hollowed- out vacuum pose factored heavily into how he was judged in competition. Zane trained in higher volume than most of his contemporary competitors, and certainly more than most lifters today. He wasn’t a proponent of training his abs with heavy resistance. Sets of 50 reps or more were the norm—which may seem extreme until you remember how well it served him. Zane also favored partial movements for his abs as a way to maintain tension throughout each rep. As you can imagine, at high rep ranges, the effect was tantamount to torture; but Zane knew the burn signified a body on the brink of change. While his reps were high, his exercises were few. The sit-up and leg raise hit his upper and lower abs, while side bends carved his obliques. Two-time Mr. Olympia Franco Columbu is proof positive that training for pure, Herculean strength writes you a ticket to a body rife with dense, quality muscle. His years as a competitive bench-presser gave him a chest that was unspeakably well built—the separation between his upper and lower pecs was shockingly distinct. Columbu wasn’t afraid to go heavy, even with isolation movements like flyes, where he’d still occasionally train to failure at 4–5 reps. He’d often put in 24 or more total sets of work, ensuring that no muscle fiber went untouched. And to this crazy level of volume, he’d add intensity boosters such as supersets. Haney’s back was as wide as one would expect from an Olympia competitor, and then some. But what truly set him apart was the striking thickness of his back from top to bottom—the coiled bundle of muscle that jumped out at the audience when he hit a back double-biceps on stage. At the time, such development was considered a game-changer. These days, Olympia competitors who can bring their backs to within a stone’s throw of Haney’s stand a better chance than most of faring well when it comes time for callouts. Not surprisingly, Haney started off his back workout with heavy barbell rows. He was, however, a champion of keeping a strong arch in his lower back and control- ling the weight—little benefit was gained from swinging a barbell wildly, he believed. This move formed the basis of the back depth for which he was known. He followed by addressing his lats’ north-to-south development with wide-grip pulldowns, and he’d finish his middle back and rhomboids off with some type of seated cable row. Notably, his back workouts were rarely more than 10 sets deep. He focused on making every rep count, rather than follow the spray-and-pray approach of ultrahigh- volume back trainers who do up to 20 sets per workout. Use a reverse dropset, beginning with a light weight and doing 25 reps, then increasing the weight three more times, doing 15, 10, and 8 reps. Do not rest between weight increases. Bannout would add weight from set to set, aiming for a progression that would allow eight reps on his fifth and final set. Columbu would pyramid up in weight each set. Pyramid up in weight on each successive set, meaning 12,10,8,6.